Camelot Creature Comforts - Pet Shop Littleport Ely - Pet food and care supplies for cats, dogs, birds, small animals, farm animals, fish, horses, etc. Welcome to our dog page. When you visit us you will see we are a very keen dog owning family! 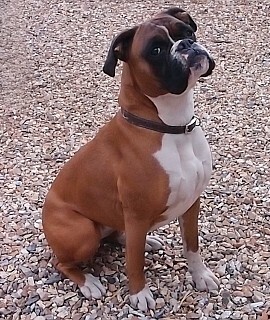 Pictured is Ruby the boxer who loves everyone who comes to the shop, we also have her equally friendly mum Holly. Then there is mini poodle Honey and Ziggy the Jack russell, who is self appointed treat taster(lucky for her we have a massive range of treats!) and i think most peoples favourite is ball chasing jack russel Rizzo. We also sell a huge range of bones, dental, puppy and natural treats. We stock our own label value working dog and super premium foods at superb prices! Camelot Super Premium is a top quality food and available in adult(lamb, turkey, chicken, duck or salmon), senior, light and puppy also grainfree. In bags of 2.5kg,7.5kg and 12kg. Several varieties are also sold loose. Our ever popular Camelot working dog is excellent value at only £10/ 15kg We are also stockists of Simpsons, 1 of only 2 products given 5*/5 in Which dog food. A large selection of toys, collars, leads, harnesses and coats are available. We have a variety of baskets, beds, duvets, heavy duty, waterproof and vet beds. We also sell dog crates and puppy runs. We stock a variety of health and hygiene products. Here is some of our range and prices, many more are available in the shop. Please feel free to contact us for details on any food or product you require. © 2014 Camelot Creature Comforts. All rights reserved. Website proudly designed by Treefrog Multimedia.